Barbie or Bratz? Queen of Hearts or Queen of Tarts? Isn’t it time for someone else to take over? Barbie makes me puke. The overly-sweet and glassy-looking Barbie is simply not “in” any more. Mattel, the company behind Barbie, has been trying hard to keep interests alive by incorporating more multi-cultured and modern looks but the sweet smile is always too fake and dazzling, in my view. Is Bratz the right doll to take over? Well, that leaves to be seen…. It may push Barbie out of the picture or it may create a stronger reaction in favour of Barbie. After all, the sassy and tart Bratz (as the name indicates) enhances Barbie’s elegance and class. Mums would opt for the latter. But on second thought, some modern mums may prefer a more realistic and fun doll for their kids. Well, it’s the battle of the dolls. Global sales of Bratz dolls and related products are fast taking over Barbie’s. While Barbie still commands the higher figure of US$3 billion, Bratz’s sales reach US$2 billion and show an increase of 12.8 per cent. Dolls actually reflect the values of society and possibly even direct these values. So, is society, or more accurately, girls, heading towards a more hip-hop, individualistic, street-wise and multi-ethnic outlook? Has the materialistic, elitist, and decorative woman disappeared in the dust of history and children as well as adults are just taking time to realise it? Or do people still prefer to relegate dolls to its realm of fantasy and leave painful reality where they belong? The ability to read trends and fashions is of primary importance here. The popularity of Britney Spears, Jennifer Lopez, and Angelina Jolie are tell-tale indicators of popular culture. The doll business is a £100 million market and having reigned for 47 years, Mattel is not set to let its monopoly go to Bratz without a fight. But the newcomer, having entered the fray only four years ago, is already commanding 40 per cent of the market share. It’s a big pie but these two giants are not likely to share, or are they? It’s a doll-eat-doll world out there. Barbie is a best-selling doll produced by Mattel Inc that was launched at the American International Toy Fair on March 9, 1959. Barbie’s full name is Barbara Millicent Roberts, and over the years she has been given many companions, the best known being her beau Ken (Ken Carson), who made his debut in 1961. Like Barbie, Ken shares his name with one of Ruth Handler’s children. Barbie and Ken have a famous on-off relationship and they announced a split in 2004 which seems to have been only temporary. Other longstanding friends in Barbie’s ethnically diverse social circle include Hispanic Teresa, African American Christie and Steven (Christie’s boyfriend), and Kayla. 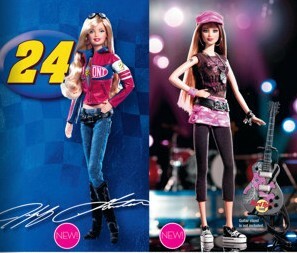 Find out more Barbie collection? Click here. Bratz is the name of a line of 10 inch (254 mm) dolls produced by MGA Entertainment starting in mid-2001. They are created in both genders, “Bratz Boyz” having followed Bratz “girls” shortly after the girl dolls entered the toy market. Bratz dolls are characterized by an oversized head, with wide eyes, full lips, a small nose, a short body, and shoes that snap on and off (without shoes they have no feet). This entry was posted on Friday, December 29th, 2006 at 9:49 am	and is filed under Interesting Stuff, Wonderful Things. You can leave a response, or trackback from your own site. 4 Responses to "Barbie or Bratz? Queen of Hearts or Queen of Tarts?" You know you’ve made it when you’ve been moulded in miniature plastic. But you know what children do with Barbie dolls – it’s a bit scary, actually.